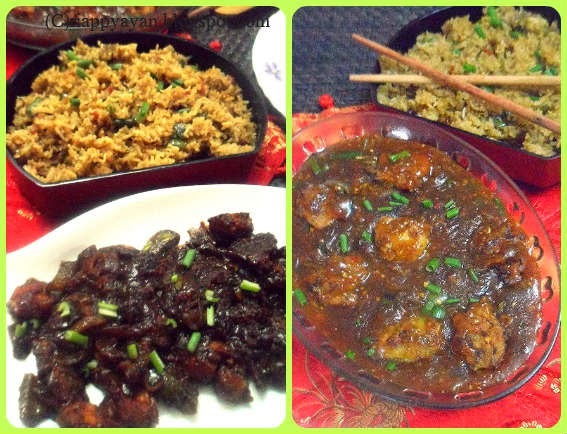 in Fusion Recipe, Indo-chinese, Side dish, Veg. The day before Valentines day, I asked my daughter,"what do you want to have for dinner? Today I'll cook something special for you on the eve of V-day". She scratched her head for sometime, as she had so many in mind that time, finally asked me to make something Chinese. Finally on dinner, I ended up doing 3 Chinese dishes she loves to eat. Her first love, Chilli Chicken and Fried Rice, I made vegetable manchurian too and she absolutely loved the whole dinner and showered with with her love and my day was made. Here, vegetable dumplings are made by deep frying in oil and then cooked in manchurian sauce. There are very specific ingredients needed for manchurian sauce and we can make a vegetable dumpling or dumpling made with chicken or any other meat. The consistency of gravy is made both dry or with more gravy versions. in any variation, it is a great side dish with Chinese main course meal, like, Fried rice or fried noodles. I followed the recipe from EZ CookBook. I did follow her recipe exactly, but I had to deal with the unavailability of some ingredients in my pantry, so ahd to change a bit here and there but the end result was great. I thank EZCookBook for the recipe. Light Soya Sauce - 1 tbsp. To make vegetable balls/dumplings : In a bowl, take chopped carrots, cabbage, spring onions and onion,and all the ingredients listed for the manchurian. Mix with just 2-3 tblsp. of water to make a semi-solid batter, so we can able to make and hold a dumpling inside our fist. Heat oil to deep fry the dumplings, drop them one at a time and in medium flame fry them till brown from all sides. Remove on paper towel and keep aside. 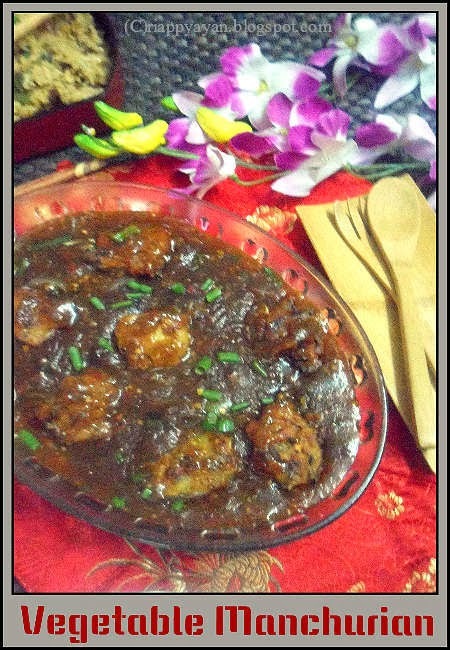 To make the manchurian gravy : In a small bowl mix well corn flour with 1 cup of water and keep aside. Heat oil in a pan, add garlic and onion and saute for few minutes. Add capsicum and stir well in oil for 2-3 minutes. Then add salt, pepper, sugar, chili sauce and soya sauce. Mix well. Add corn flour mixture and simmer it for a while until you get your desired consistency. Just before serving, drop the vegetable dumplings in the gravy otherwise, they will soak all teh gravy and become soggy. Enjoy with fried rice or hakka/stir fried noodles as a side dish. 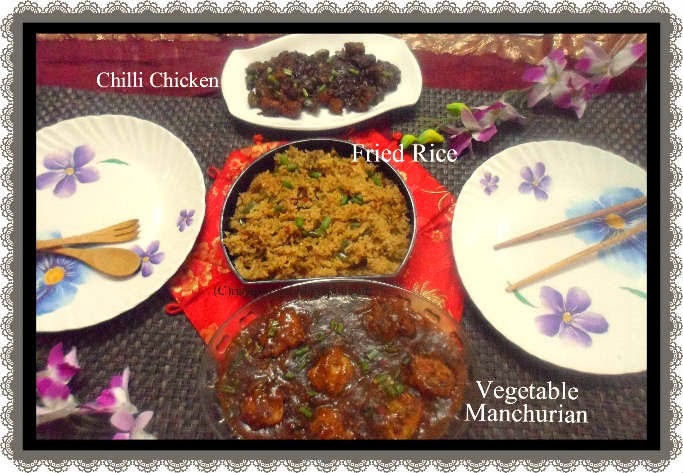 This vegetable manchurian, I served with fried rice(recipe below) and Chilli Chicken(for recipe click the link). Heat oil in a pan, add all vegetables and saute till they are just cooked but still crunchy. Add garlic paste and green chillies and stir fry with the veges for a minute. Then add vinegar, soy and green chilli sauce. Mix well. Add cooked rice and in high flame mix well with everything. Season well with salt and pepper powder as per your taste. 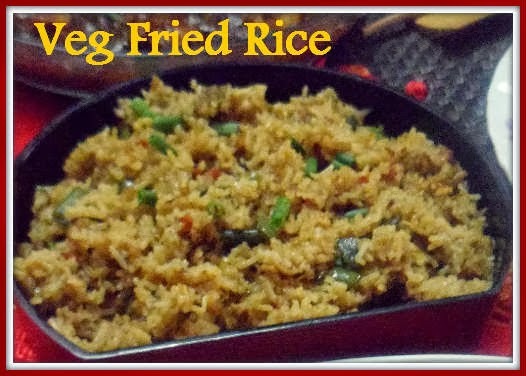 If you want to add eggs, as authentic chinese fried rice has, add one beaten egg just after vegetables are cooked and mix well (like scrambled egg). This way, you can have Egg fried rice. 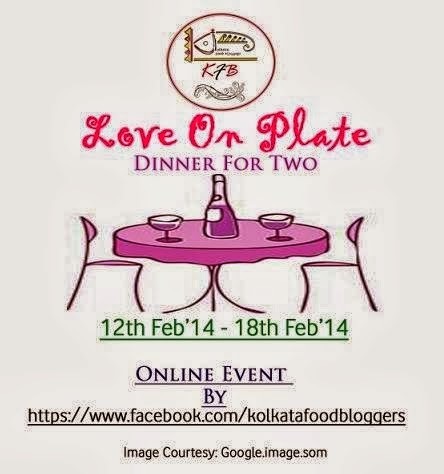 This whole Indo-Chinese dinenr menu is going to take part Kolkata Food Blogger's online event, "Love on plate-Dinner for two"
I would love to invite my blogger friends to participate in this on going event, if you have something that fits the theme. 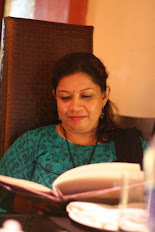 Th event will end on 18th FEB,'14. For details, click HERE. Labels: Fusion Recipe, Indo-chinese, Side dish, Veg.